Starting from as low as $700 to move from Miami to Fort Myers (or moving from Fort Myers to Miami). Only Straight deliveries. No waiting! The rapidly growing city of Fort Myers is opening its arms to new residents. If you are planning to move from Miami to Fort Myers, FL, Easy Florida Moving can do that safely, and with the utmost care for you and your family. We are unmatched when it comes to the moving business. Easy Florida Moving is a company that offers great relocation opportunities for those who think of a moving process as big trouble, which is exactly true. But not for a professional team of packers, which can handle any job, a.k.a. Easy Florida Moving! Yes, we can offer a complete package of services to our clients, who are looking forward to move safely and not to spend their time packing and heavy lifting. Leave this work to a knowledgeable team that will handle long-distance, local, residential, or commercial moving processes. Easy Florida Moving offers a broad number of services, like loading/unloading, packing, unpacking, furniture assembling, and disassembling, as well as labeling and personalizing your personal property. Now, how convenient is that? Trust us, you won’t want to do all that and also drive for three hours with your whole household and family in the car. 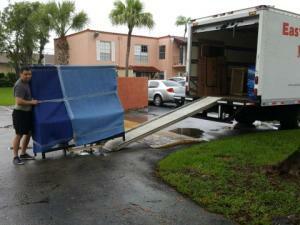 Leave moving from Miami to Fort Myers to us, the creative and trustworthy local movers. When you find yourself in a situation that you are not yet ready to move into a new office or home, Easy Florida Moving offers our clean, well-operated and secure storage spaces. We are a flexible company, with which you can work both short or long term. Before the start of the moving process, one of our employees can visit your home and offer you a Flat Rate Quote that will be the same throughout the whole moving process. We will happily accommodate any needs and help you with any tasks so that you can rely on us. As we have previously stated, we offer all-inclusive moving options, as well as storing solutions and providing a single, no-surprise Flat Rate fee. Also, we can take care of the hardest items to move, such as pianos, sports equipment, and computers. Easy Florida Moving is proud to say that we are available 24/7, and every client is special to us. Therefore, we take every comment, suggestion, and recommendation that you give very seriously. Highest quality moving tools and materials are our special gestures to our customers moving from Miami to Fort Myers, Florida. No box or blanket that we use will be dirty, or not properly maintained. Our trucks are clean, and blankets are meeting the highest standards set by the moving industry. Give us a call, and we will be happy to answer any questions you may have, as well as give you an obligation-free moving quote that will meet your budget. Let us move you anywhere you want!